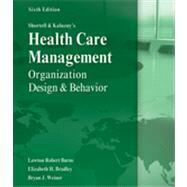 Completely updated to address the challenges faced by modern health care organizations, the sixth edition of SHORTELL AND KALUZNY'S HEALTH CARE MANAGEMENT: ORGANIZATION DESIGN AND BEHAVIOR offers a more global perspective on how the United States and other countries address issues of health and health care. Written by internationally recognized and respected experts in the field, the new edition continues to bring a systemic understanding of organizational principles, practices, and insight to the management of health services organizations. Based on state-of-the-art organizational theory and research, the text emphasizes application and challenges you to provide a solution or a philosophical position. Coverage includes topics ranging from pay for performance and information technology to ethics and medical tourism and expands upon a major theme of the fifth edition: health care leaders must effectively design and manage health care organizations while simultaneously influencing and adapting to changes in environmental context.